I feel the need, the need for tweed. This 8% Imperial Pumpkin Ale might as well be pumpkified liquid tweed for my purposes. Pouring a thick scarlet-amber, this ale has a musk of cardamom, pumpkin, cloves, and cinnamon. 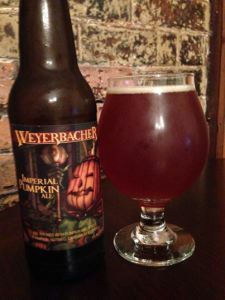 Not one of those flavors is lost in a complex warm whirlwind of cloves, nutmeg, gooey butterscotch malt, cardamom, and copious heaps of sweet, toasted pumpkin. By all means, this is a late night sipper, with a lovely secret of simcoe hops and alcohol burn in the finish.